Cambrian fossils have, for the first time, been found on the west coast of Norway. They were found by cand. real. Bjørn Andersen in 1949 at Ritland, Hjelmeland district, Rogaland County. The fossils occur in autochthonous dark shale, and belong to the Paradoxides oelandicus stage (Early Middle Cambrian) . Trilobites (including Ptychoparia anderseni sp. n.) , brachiopods, hyolithids, sponge needles, and problematica (including archaeocyathids?) have been collected. 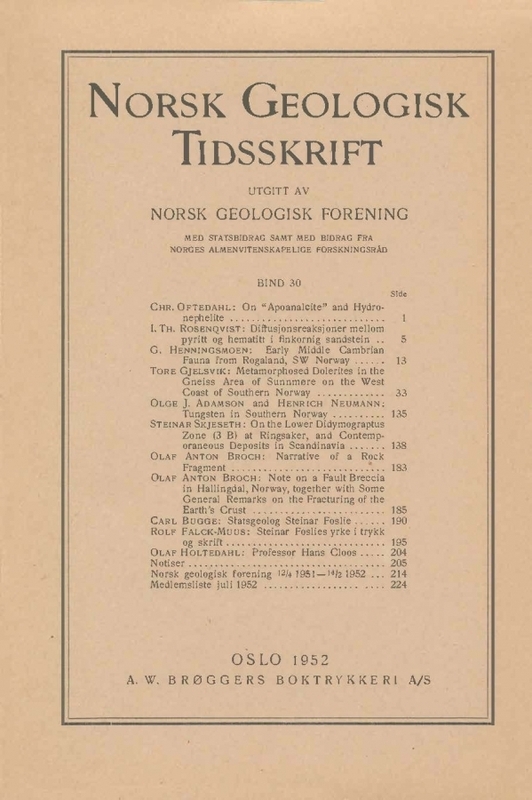 The absence of this stage in the autochthonous series in the Oslo region, as well as in the Swedish areas Vastengötland and Scania, suggests a land mass in these areas in P. oelandicus time, bordered to the north by the Caledonian geosyncline, and to the east by a shallow sea.